This time of year, I switch from hot, steel-cut oatmeal to meusli. What is meusli? It’s similar to granola, only not baked in oil the way granola is. Pronounced, MEW zlee, it’s a combination of oats, nuts, and dried fruit. I love it in the morning with milk and honey. Sometimes, I’ll slice a banana for it, or add fresh raspberries or blueberries. It’s also handy as a yogurt topping. I used to get it in the bulk food section of my grocery store. Recently, I’ve started mixing my own. It’s so simple! 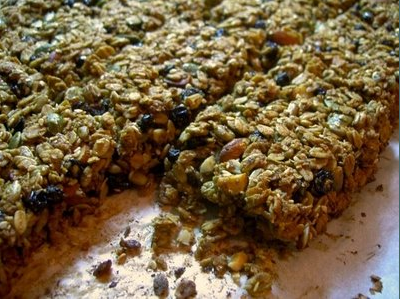 Optional: Flax seeds, dried apples, dried cranberries or any other dried fruit. Store in an airtight container. It will keep for 8-12 weeks. Veggies: peas, broccoli, edamame, corn, spinach and whatever else sounds good. Left-overs: slices from home-made roast beef or roasted chicken. Just thaw in the microwave to add to a salad, soup or sandwich. Soups, Rice & Re-fried beans: home-made and stored in 3-cup/24 oz. containers. Chopped onions: Recipes often call for chopped onion, but may not always require an entire onion. I chop the entire onion, and place the extra in a Ziploc bag. It freezes beautifully and then when I want just a handful for an omelet, it’s ready to go. When cooking frozen onions, omit the oil at the beginning or you’ll have a splatter. Once the onions have thawed in the pan and appear to be sauteing nicely, you can add a teaspoon or so of oil as needed for your recipe. Food can be so complicated. I break it down into two parts. If it’s deep fried, don’t eat it. Anything else is okay.